As one of the fastest growing companies in the region, Insuritas is revolutionizing how consumers shop for insurance and related products! While web-based technology is transforming the way companies interact with their customers, it’s the unique combination of our award-winning technology and our amazing people that truly differentiates us! And guess what, it’s working! We’re always looking for motivated people that can help us fulfill our mission of achieving maximum results for our clients. Email your resume to hr@insuritas.com today! Insuritas has joined with WebCE, a nationwide provider of Continuing Education for insurance agents, to deliver all of the web-based courses you need to renew a single license. Paper-based courses and exams are also available in most states. Access the Education Center now! 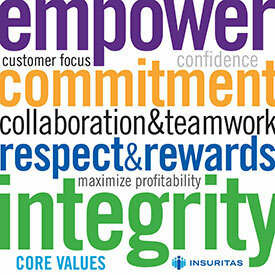 Insuritas is proud to be an equal opportunity workplace and is an affirmative action employer. Christie was helpful, friendly and more than willing to answer any questions. Customer service was A+!